Here are a bunch of pictures I took when I built a mouse rack about a year ago. I thought some people might be interested to see it while in the process of building it. Sorry, it's kind of long. It doesn't all fit so had to split it up, first post is building it, second post is plumbing. 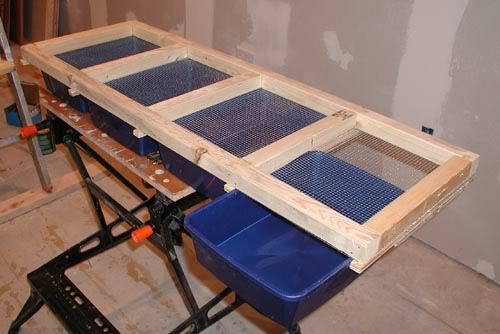 Here are my plans for building a 40 tub mouse rack using small Van Ness cat litter pans that I found at Target. 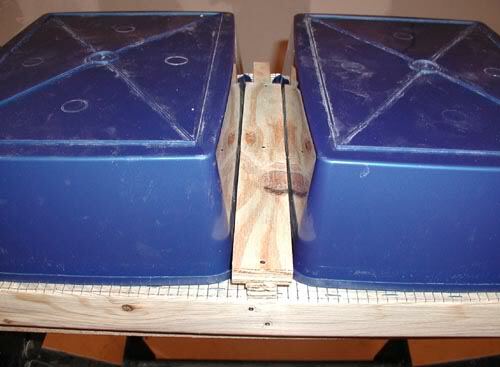 These tubs are approximately 10" X 14-1/2" . 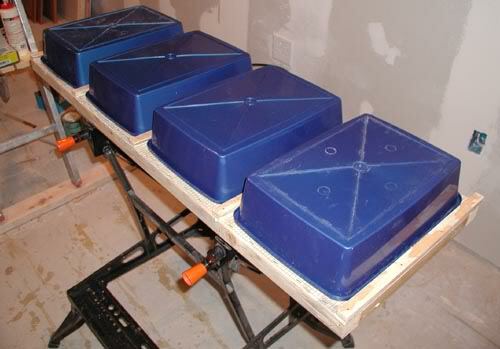 If you use another brand of tub, you'll have to adjust the measurements around the dimensions of the tub. Each level holds 4 tubs and the entire rack is 10 levels high. First, start off with the frame of the level. I used 2" X 2"s that are 43 1/2" long. Nail this onto the end braces that are 12" long. I used 2-1/2" 8d finishing nails and glue. Here are pictures of what they look like. Then you need three more 12" braces, one in the exact center of the level so center the middle 12" 2" X 2" brace at 21-3/4"
The other two braces are centered at 11-1/4" from each end. All of the braces are attached with glue and 8d finishing nails. 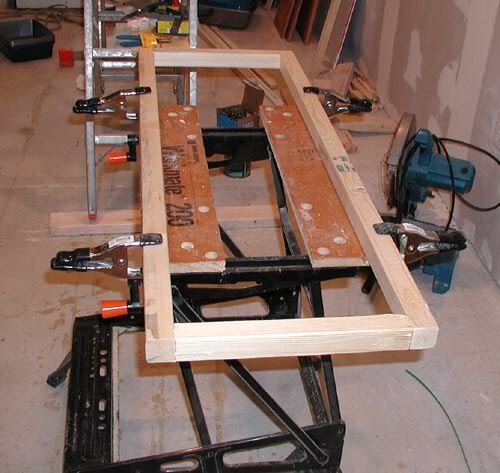 Once the frame is finished staple on the hardware cloth screen, make sure it's tight. 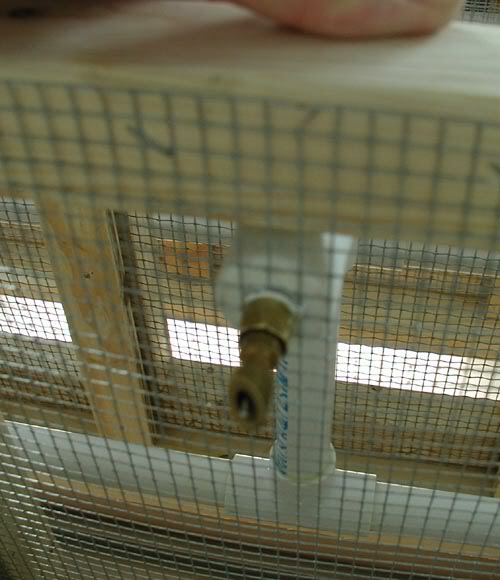 The mesh size you use has to be small enough so the mice can't squeeze through (1/2" mesh is too large) But large enough so that the mice can eat through it, 3/8" mesh is ideal but impossible to find. 1/4" mesh works just fine though. 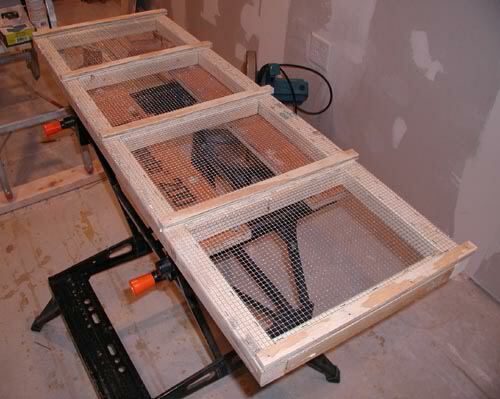 Next you'll need to put on some spacer bars and slide rails to hold the tubs in place tight against the screen. I used 1/2" plywood. 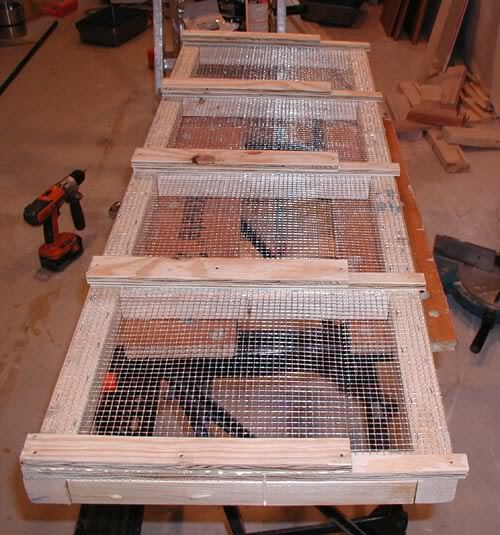 The spacers are 3/4" wide by 14-3/4" long you'll need 5 per level, the slide rails for the ends are 1-1/8" X 11", you need two of these per level, and the slide rails for the middle sections are 1-1/2" X 11" and you'll need 3 of these per level. Make sure the tubs fit between the spacers before going on, they should be tight but not so tight that they are hard to pull through. The slide rails for the middle spacers should be placed so that they are centered over the spacer and are even with the back of the level. There will be about a 4" gap between the front of the slide rail and the front of the level. This is so that you can remove the tub without running into the sipper valve that will be going through the screen at the front. Here is a picture of an end slide rail and a middle slide rail so you can see that the middle rails are centered on the spacer and the ends are flush with the spacer on one side. I attach the slide rails with glue and 2" 6d finishing nails, make sure you drill guide holes first that are slightly smaller in diameter then the nail before nailing them on. Otherwise you could split the slide rail or the spacer underneath it. Heres a picture of a finished level upside down and shown from the end so you can see the gap at the front of the slide rails. Here is a picture of the completed level flipped right side up complete with tubs. 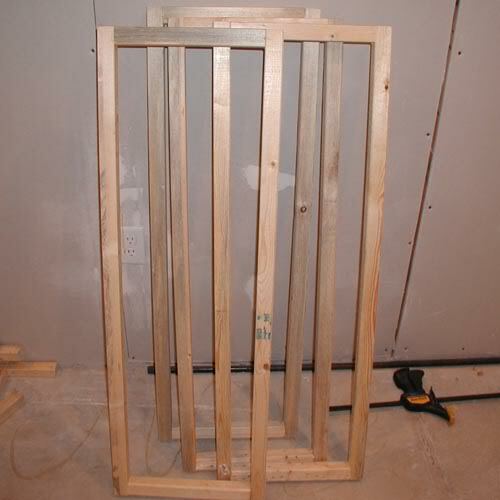 I used four 2" X 4"s as uprights, one at each corner, to attach the levels to. The 2" X 4"s are each 72-1/2" long. I marked them at 6" from the bottom and then every 7" after that (levels are attached so that the top of the level is at 6" from the bottom, then 13" then 20" then 27" etc...) for a total of 10 levels. 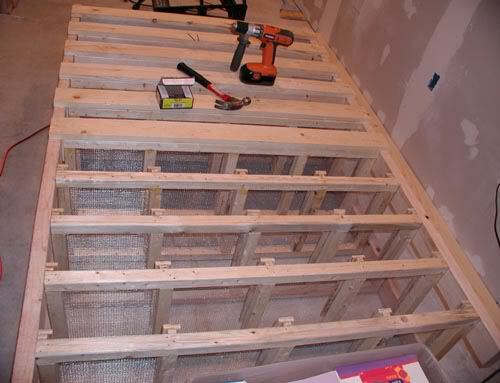 Then I attached 1" X 4" boards 46-1/2" long, to the back of each level as a backstop for the tubs and as additional bracing to help keep the rack square. I drilled 3/8" holes in the middle of 40 PVC end caps so I could screw the valves in, no need to tap the holes, the valves screwed into the pvc fairly easily with a socket wrench. 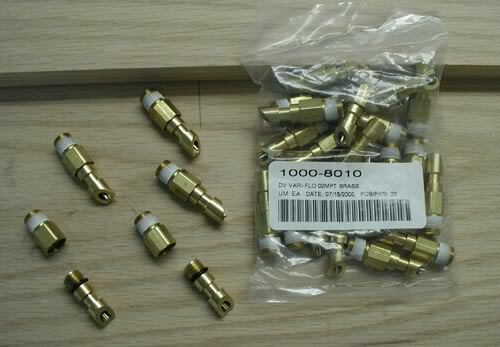 I did not screw in the valves permanantly at this time, I just wanted to show you how they look. I cemented the end caps onto 40 90 degree elbows with a 1" long piece of 1/2" PVC tubing. For fittings, I used a total of 40 end caps, 52 90-degree elbows 39 T's 2 shut off valves, one screw on quick connector and a bulkhead fitting. I also used the better part of 6 lengths of 10' X 1/2" PVC tubing. 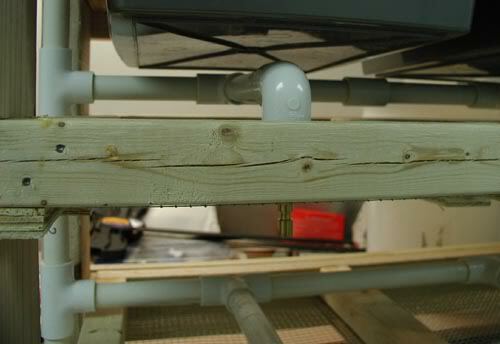 In this picture you can see a completed level, you can see the end caps are attached to the elbow which attaches to a 5-1/2" piece of tubing that attaches to a 'T' The back of the level where the 'T's are attached to each other starts with a 4-1/5 length of PVC, then a 'T' then a 9-1/2" length of PVC then another 'T' and another length of 9-1/2" PVC and the 3rd 'T' then another length of 9-1/2" PVC with an elbow on the end. The goal is to make sure that the end caps are all flat and on the same plane. You can see where I goofed up and had to cut the level apart and fix it with straight connectors so that it was flat. A good way to assemble the level would have been to cement the 5-1/2" tubes to the 'T's first, then attach the 'T's together with the 9-1/2" tubes making sure to use a hard flat surface so that the 5-1/2" tubes stay laying flat on the floor, attach the elbows with the end caps last (make sure they're pointing in the right direction). A rubber mallet is handy to make sure the tubes are seated all the way into the fixtures. I cemented everything together with PVC cement. 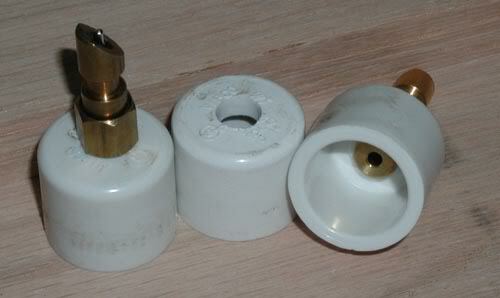 Make sure that each end cap is laying flat against the hardware cloth before you attach the sipper valves. you'll need to cut out a square of wire using needlenose wire snips to make sure that the valve can fit through the mesh. screw the base of the valve into the end cap through the hardware cloth. Screw the top of the valve into the base. Make sure that all of the valves are firmly screwed in through the hardware cloth into the PVC tubing and make sure that the whole assembly is level to cut down on air pockets. Here is a picture of the valve going through the hardware cloth, view is from the front of the rack. Here is a picture of the upright water supply line before it was attached and cemented into the levels. There are 6" tubes between each of the 'T's. I also put a shutoff valve in the middle so that I could shut off the water to the lower 5 levels and just use the upper 5 levels if I ever wanted to. Here is a picture of the upright water supply tube after it's been attached to each level, you can see I have a screw on quick connector at the top. Here is a closeup of the middle shutoff valve. 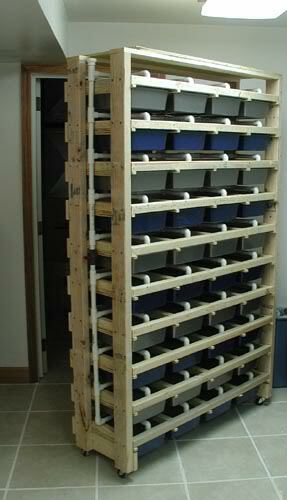 Here is a picture of the completed rack with tubs. You can see I've also added casters to the bottoms of the 2"X4"s So I can wheel it around and clean around it out easier. 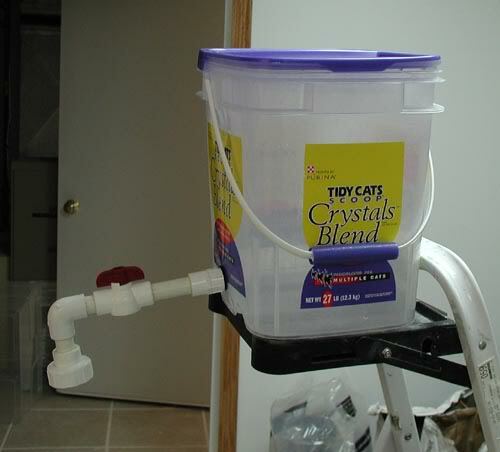 Here is the water supply bucket that I'm using. 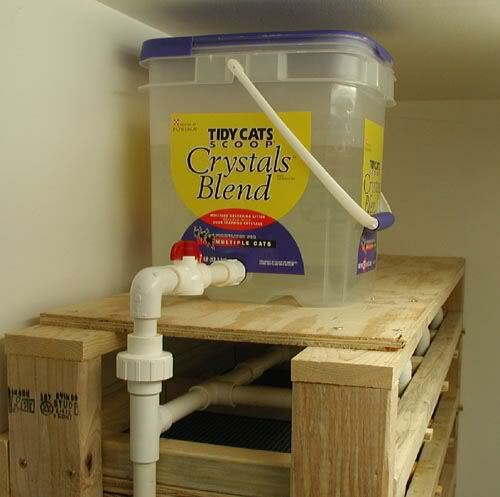 I used a clear bucket so I could see the water level, it also has a top so that dust doesn't get into the water supply. The PVC is attached to the bucket using a bulkhead fitting that basically is a compression fitting that screws in through each side of a hole at the bottom side of the bucket. This is then attached to a short length of PVC tubing going to a shutoff valve which then goes to an elbow that goes to the other half of the screw on quick connector. 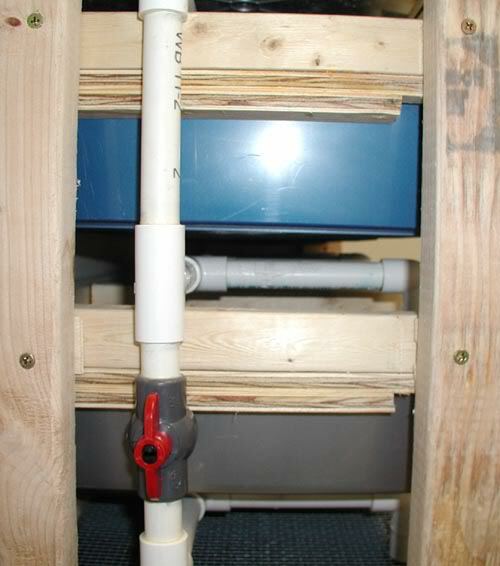 Here is a picture of the completed bucket assembly attached to the water supply tubing with the screw on quick connector. 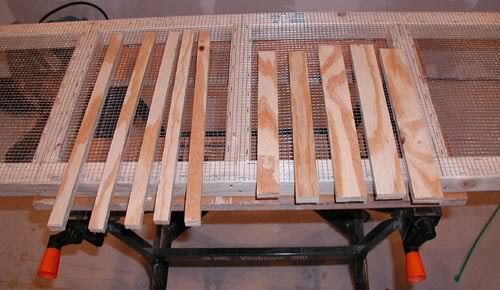 The whole thing rests on top of a piece of plywood nailed to the top of the rack. 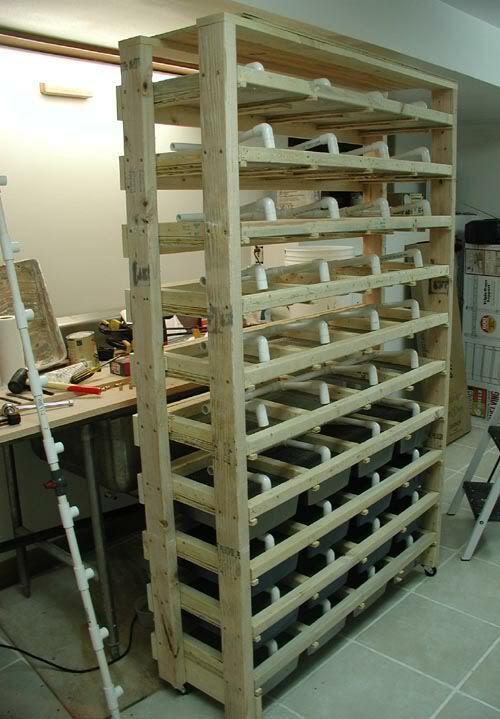 When complete, you'll have a low pressure gravity fed watering system for your rack. 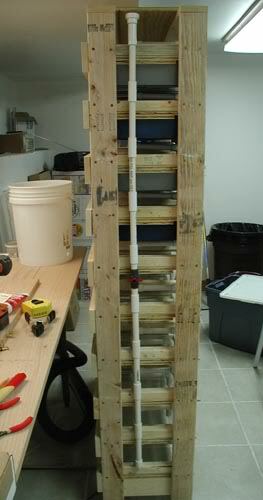 Here is the completed rack with the water supply hooked up. It contains 10 levels in all with 4 tubs per level for a total of 40 tubs. When I have it filled to capacity I expect to have 1.3 adult mice in each tub for a total of 160 adult breeder mice which I hope will eventually supply me with over 1000 pinkies a month . Let me know if this was helpful to anyone building their own mouse rack or if you have any other tips or suggestions you would make. I remember those pics! I used a very similar design after seeing it on the KS forums, thanks for posting it up (both then and now ) Has it lived up to your expectations? 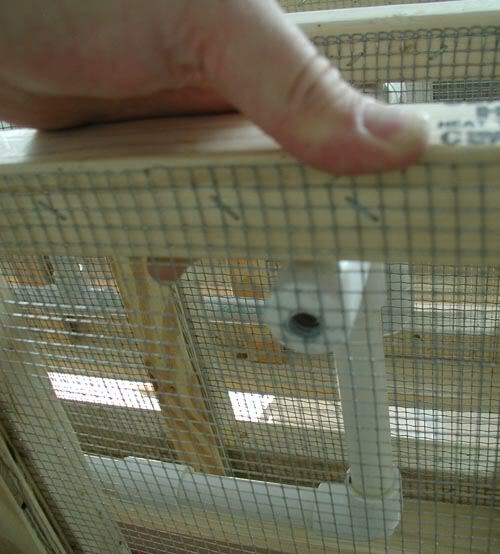 I found that my Peromyscus can actually get to the tubs with the 1/2" spacers (man they can chew too! ), but no problems with the lab mice. How has the PVC plumbing job worked out? I used flexible sprinkler drip line and it has worked well. Anyway, thanks again for sharing! The PVC tubing is working out great. It's the best thing I did on that Rack. If I were to do it over again, I'd want bigger tubs though, These tubs are a bit small for raising an entire litter to weanling size. Still, overall it's worked out pretty well. Wow! Great thread Mark! 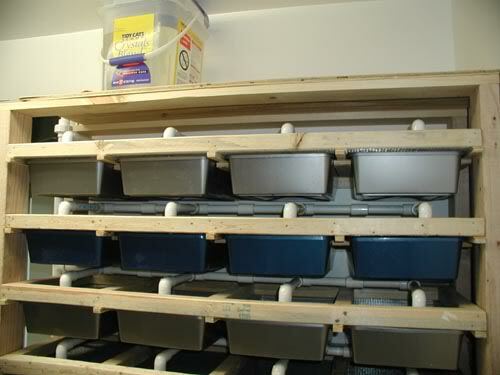 I'd like to do a similar rack setup eventually, only for rats. I like the rigid PVC setup, I'm sure it is less likely that the lines would clog with PVC. How well do you like the watering system as far as ease of maintenance? Keep up the good work with your DIY threads. Mark, I've been looking for this for about 6 months.. I remember you posting it awhile back and I could not find it again. Thanks for posting it again..
P.S. Looks like you did a great job building it..
Mark, thanks for posting the details with pics. It sure does help! 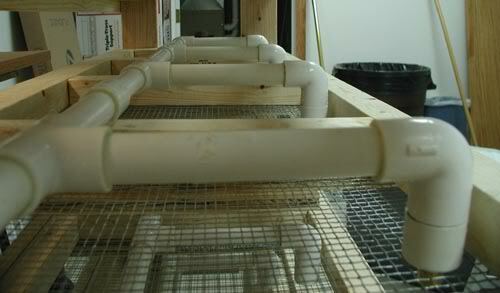 When we built a rat rack recently we used the usual flexible tubing . . . I will definately consider the PVC next time. Thanks again. From my experience, even with narrow tubing, the issue isnt the lines clogging , it is with the valves clogging. I'm really curious about the pros for watering setup using pvc vs flexible tubing. From my experience even in a no light condition slime builds up inside the lines, im assuming it would be the same for pvc. If this is the case, how do you clean the pvc out, because the "slime/algae" breaking off and clogging the valves would get annoying quick. Edit: oh and i am in awe at how good of a job you did with that pvc heh, it scares me just thinking of trying that. Thank you for posting these, I've merged them and stickied it so that it's easy for folks to find! Great job! Thank you for merging this together, it does make it a lot easier to read. As far as clogs in the water line, Amazingly I haven't had one yet. Maintenence on it has been very minimal. 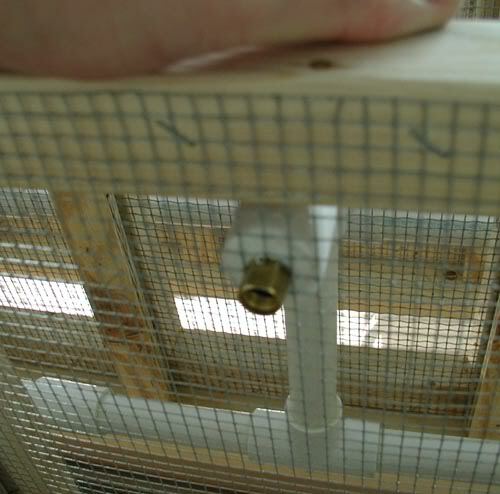 I've had only one instance where the mice stuck some wood splinters in the valve holding it open. I lost the mice in that tub and it was a mess to clean up, but I figure one time in a year isn't too bad. Other then that the only thing I do is add a capful of bleach to the water every time I fill the bucket. The person I got this idea from is Sean Bradley of EBN, He said that he's also never had a clog but just to be on the safe side he would occasionally unscrew the valves from the PVC and run water through it to flush it out. I haven't done that yet myself so I don't know how big of a job it would be.